قربانی شیخ‌نشین, ارسلان, باهوش فاردقی, محمود. (1394). سیاست‌های روسای جمهور آمریکا پس از 11 سپتامبر و صلح‌سازی در افغانستان (با تکیه‌ بر دکترین لیبرال- دموکراسی). پژوهش های روابط بین الملل, 5(16), 13-42. ارسلان قربانی شیخ‌نشین; محمود باهوش فاردقی. "سیاست‌های روسای جمهور آمریکا پس از 11 سپتامبر و صلح‌سازی در افغانستان (با تکیه‌ بر دکترین لیبرال- دموکراسی)". 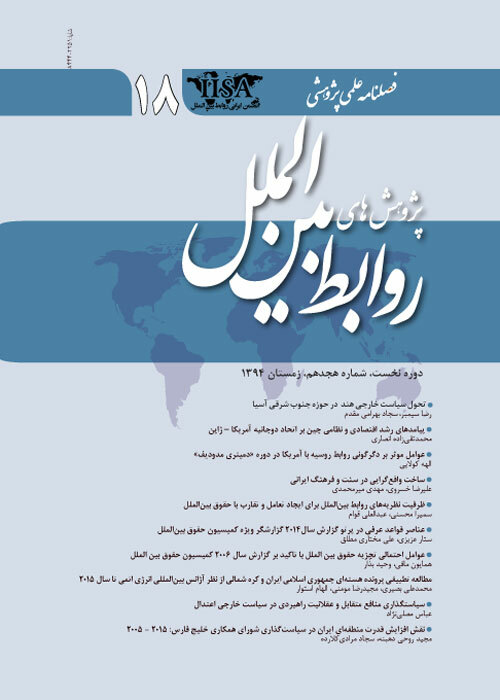 پژوهش های روابط بین الملل, 5, 16, 1394, 13-42. قربانی شیخ‌نشین, ارسلان, باهوش فاردقی, محمود. (1394). 'سیاست‌های روسای جمهور آمریکا پس از 11 سپتامبر و صلح‌سازی در افغانستان (با تکیه‌ بر دکترین لیبرال- دموکراسی)', پژوهش های روابط بین الملل, 5(16), pp. 13-42. قربانی شیخ‌نشین, ارسلان, باهوش فاردقی, محمود. سیاست‌های روسای جمهور آمریکا پس از 11 سپتامبر و صلح‌سازی در افغانستان (با تکیه‌ بر دکترین لیبرال- دموکراسی). پژوهش های روابط بین الملل, 1394; 5(16): 13-42. Afghanistan is among thecountries that feature in a long period of instabilityand in the days after September eleventh events can be seen that way for many of the events after her and causing growing uncertainty in the region and the world. FollowdbyAmericaafter the September eleventh in the global arena of world public opinion in the fight against terrorism (that failed states such as Afghanistan and its growth medium) along with it. America has actually tried this with different groups in the process of power sharing and catalyzing process of democratization has in stabilizing the role. Hence, this research seeks to understand how the effects of the policies of the United States America after September 11 in Afghanistan.Andthe assumption is that it looks different policies (both military and liberal) United States America, especially its democratic-liberal policies in order to create stability and peace of the done.Although these policies in the country faced with the contradictions and challenges that this descriptive- analytical approach taken in this study.